And of course we met the sheep too, which was the most exciting of all. Because not only Jet was working with them for the first time in her life, but me too. Funnily enough, I first realised that they are big. From a far distance you wound not think that these animals are high enought to bite you neck if they wanted. Of course they don’t want it because they were born to graze nicely at meadows (actually their life is about continuous grazing, their instinct calls them to start eating in a second even after a stressful moment) and hold together when something dangerous approaches them. They are of course not dangerous but I had to realise that first 🙂 I learned that sheeps flock together wich is really good when your dog makes a mistake and she distrubs the sheep apart. Following that, sheeps go and find each other again to form a nice little (or big) group again. When you want to divide their flock into two on purpose, their inborn instinct of staying together at any cost makes your job really difficult. I watched others practicing this excercise and thanked God silently for having to do this only on higher level of sheepdog work. Sheepherding really brings the instinct out of the dog. And the more instinct comes the lower is the level of obedience. At least this it true until the dog is not trained a little to control herself and pay attention to her handler. As time went by and we spent more time with sheep, Jet’s herding instinct revealed more and more and paralel, her obedience faded. 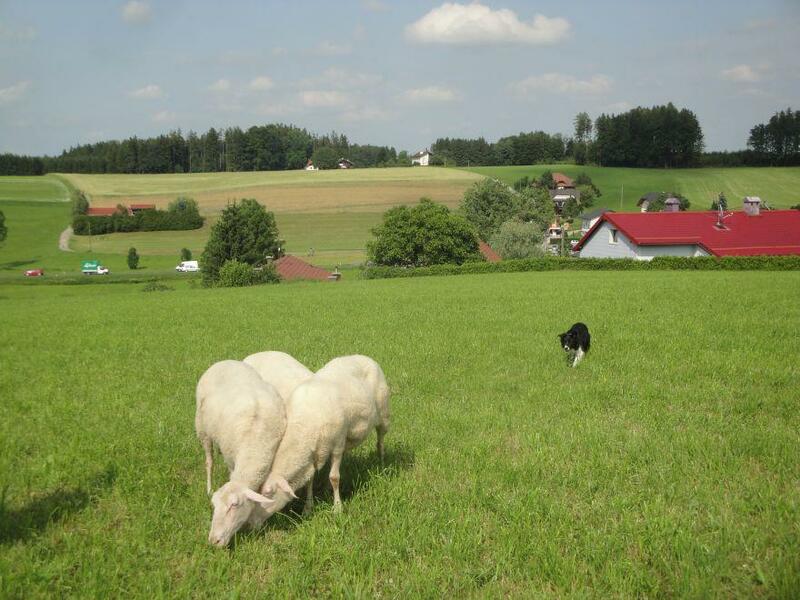 As she is a nicely obedient and listening dog, for the second training session already we left the sheep-pen behind and went trianing to the meadow. We learned what is flank and outrun, what is lift, shade and drive. (In short, these are the movements that a sheepdog does to herd to flock to her handler or keep it together.) We practiced these on a beginner level and trained Jet to find the good working distance between herself and the sheep. The training went very well considering that we both are beginners in sheepdog training and also that Jet is only 7,5 months old now. She worked very nicely making no harm or stress at the sheep. As for me, I have a lot to learn. Sheepdog training is nothing I have ever done before with a dog. You have to trust your dog’s instinct more than in anything else – the more she can work from her instincts the better and the more independent her herding will be – but in the same time you have to teach her to listen to you. Working on a very high level of instinct and staying obedient in the same time is not easy at all for a dog. It will be a long way to achieve a good level of performance in this sport, but good work takes time and it is worth doing it I think. It is really great to see that the dog loves working and doing it makes her happy. To me it is a great way to learn not wanting to control every single moment of the (dog’s) life, but let the dog does her job. 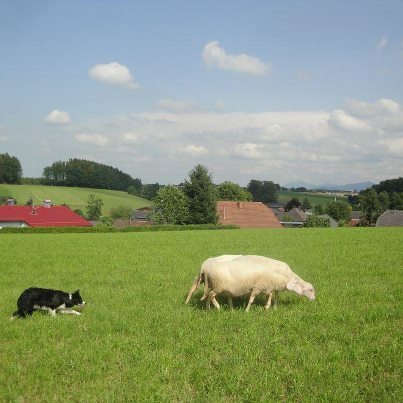 It can be also a challenge to transfer this high drive to agility and obedience I experienced in the sheepdog training.